In recognition of National Lung Cancer Awareness Month in November, Silver River Basement Systems is encouraging all Colorado & New Mexico homeowners to test for radon in their homes. Lung cancer is the leading cause of cancer deaths in the United States. While cigarette smoking is the leading cause of lung cancer, radon gas is the leading cause of lung cancer among non-smokers. Lung cancer is often thought of as a self-inflicted disease. This misconception has unfortunately made it one of the most deadly diseases. Lung cancer is also among the causes that receive the least amount of research funding. Each year, more than 200,000 Americans are diagnosed with lung cancer, and more than 150,000 people die from the disease every year. How is radon linked to cancer? Radon is found everywhere, in varying levels. Radon is a naturally-occurring gas that builds up as uranium and other soil particles decay. The gas then seeps into our homes and accumulates in our basements or crawl spaces. This can then travel up into the living space. When the radioactive particles are inhaled, this can damage the lining of the lungs and over time, can result in lung cancer. Radon is undetectable to our human senses and kills around 20,000 people each year; just 840 less than Leukemia. The question you are likely asking yourself is: If radon is undetectable, how do I know if I should have my home tested? The only way to know if radon is present, and putting you and your family at risk, is to have your home tested. Radon testing is easy and inexpensive. "Do-it-yourself" radon test kits are available at some home improvement and hardware stores. Some states also provide free or discounted test kits. If you prefer, you can hire a certified radon testing specialist to perform a Continuous Radon Monitor (CRM) test. Even if your neighbor doesn’t have a problem with radon in their home, the same may not be true for your house. There are many contributing factors to radon levels: season, soil composition, a home’s tightness of their building envelope, and more. The Environmental Protection Agency recommends maintaining a constant level below 4.0 picocuries per liter. Once you have had a radon test conducted and have received the results, Silver River Basement Systems can recommend the right radon remediation system to extract the gas from your home, if needed. As a qualified radon services professional, Silver River Basement Systems is compliant with all state requirements to provide radon mitigation services. 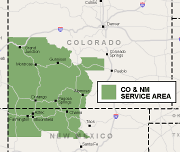 Our coverage area includes Grand Junction, Farmington NM, Durango and many parts of Colorado & New Mexico. Contact us today to schedule an appointment! There is no better time than now to make sure your family is protected from this deadly gas.